way, but there I was, flat on my face, dirt and leaves in my mouth. How did that happen? I had been moving at a pretty good clip and my toe must have caught on a root under the leaves, but really, there was no time to negotiate the fall. How I got there was moot. I picked myself up and checked out my teeth and bones. Nope, nothing broken. I looked around to see if anyone had witnessed my humiliation. Nope again. At least I had my dignity, although really? After raising a teenager you still think you have dignity? said self to self. There was blood, too. I whipped out my phone, until that moment forgotten in a pocket, and surveyed the damage with a photo. Yes, I would live to tell the tale. cooking the turkey. Not only is it flat, but it is also in the shape of a leaf. I’m just a bundle of coincidences. (ashes from the hearth.) Its many variations include herbs, olives, anchovies, strong spices, nuts, fruits, and sugar, as well as the use of puff pastry instead of bread dough. This is a simple version with a charming leaf shape, excellent and dramatic alongside some wine or cheese. You could make your own dough or buy ready-made pizza dough. 1. Dust a baking sheet with cornmeal. Sprinkle the countertop with a little flour. 2. Gently flatten the dough into a teardrop shape about 10 inches long and 6 inches wide, tapering it at the bottom. Go ahead, be a geek and use a ruler. Place it on the cornmeal-lined baking sheet with the narrow end facing you. Make three 2 1/2-inch vertical slits in a line down the center with a single edge razor. Make 2 more two-inch slits at an upward angle on each side of the central “vein,” so that the dough looks like a large leaf. Work your fingers into the openings created by the slits and stretch them to about three times their original size. You must allow enough room for the bread to rise without closing the spaces. 3. 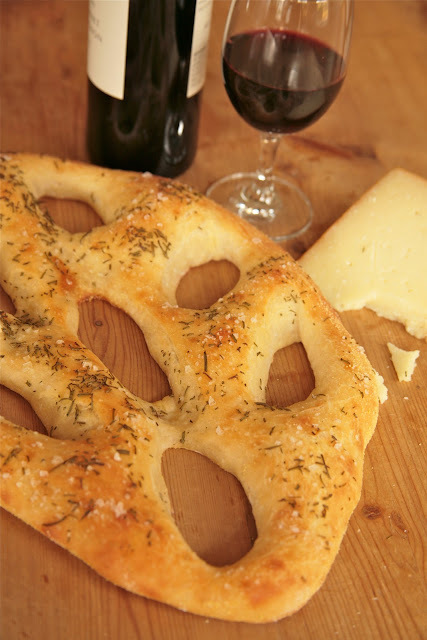 Let the fougasse rise until it has doubled in volume, from 35 to 45 minutes, longer if the dough is cold. About 20 minutes before the fougasse is ready to be baked, position a rack in the middle of the oven and heat the oven to 450°F. 4. Brush the olive oil over the top of the dough. Sprinkle it with salt and rosemary. Bake for 15 to 18 minutes, until the fougasse is golden brown. Serve warm or at room temperature on the same day that it is baked. 1. Measure the flour, yeast and salt in the bowl of a food processor fitted with the metal blade. Process for a few seconds to mix the dry ingredients. With the machine on, rapidly pour the water through the feed tube (this should take no more than 6 seconds). Continue to process for a few more seconds, just until the dough starts to come together in a mass. If the dough feels very sticky, add a bit more flour; if it feels dry, add a little water. 2. Turn the dough out of the work bowl onto the countertop. Knead it for about 5 minutes, until it is smooth and elastic. Resist the temptation to add too much flour; the dough may feel sticky but it will become less so as you knead it. It should be soft and slightly tacky, not stiff or dry. 3. Form the dough into a smooth ball. Pour about one teaspoon of olive oil into a large bowl. Place the dough in the bowl and twirl it around to coat it with oil on all sides. Place the bowl inside a plastic bag (a clean trash bag or plastic grocery bag will do) and loosely tuck the open ends underneath the bowl. Puff up the top of the bag to form a tent. Leave the dough to rise at room temperature until it has doubled in volume, about 1 1/2 to 2 hours. If you are in a hurry, 45 minutes of rising time will still be okay. Shape into the flat breads of your choice. Mix the flour, yeast and salt together in a large bowl. Make a well in the center and pour in the water. Stir with a wooden spoon, gradually incorporating the flour into the center, until stirring becomes difficult. Dump the whole shaggy mess onto the countertop and begin kneading. Power through the stickiness (with the help of a dough scraper if you have one,) adding as little flour as possible until the dough becomes satiny, smooth and elastic, about 5 minutes.